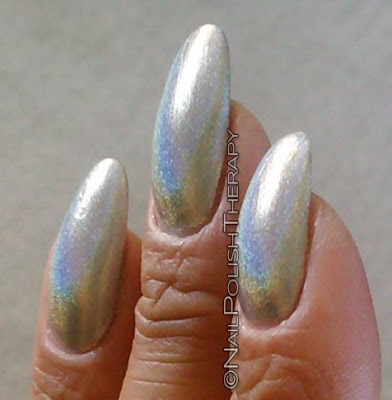 Urban Outfitters Silver Holo, Happy New Year!!! The first post of the year and I couldn't be more excited! 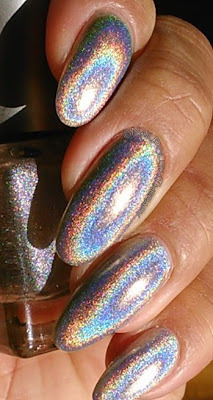 My first true holo is from Urban Outfitters and it was a mission. I went to Urban Outfitters a few times looking for the silver holo and they only had the pink and green. I got those too, but I REALLY wanted the silver one and finally while exchanging Christmas gifts I found it. So while my husband and I were sick for 3 days after Christmas, and I didn't get to do my NYE nail designs I had planned, I mustered up enough energy to put this gorgeous color on. 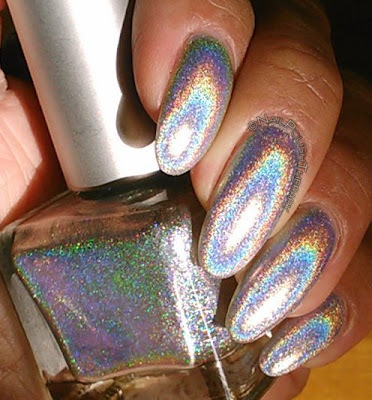 As you can see my nail are very curved and this helped when catching the holographic rainbows. 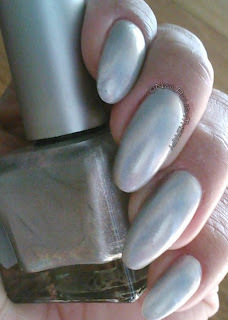 The formula on this was thinner than I expected but very consistent, and went on in 2 easy coats with full coverage. I couldn't stop staring at my nails. What are your thoughts? feelings? concerns?